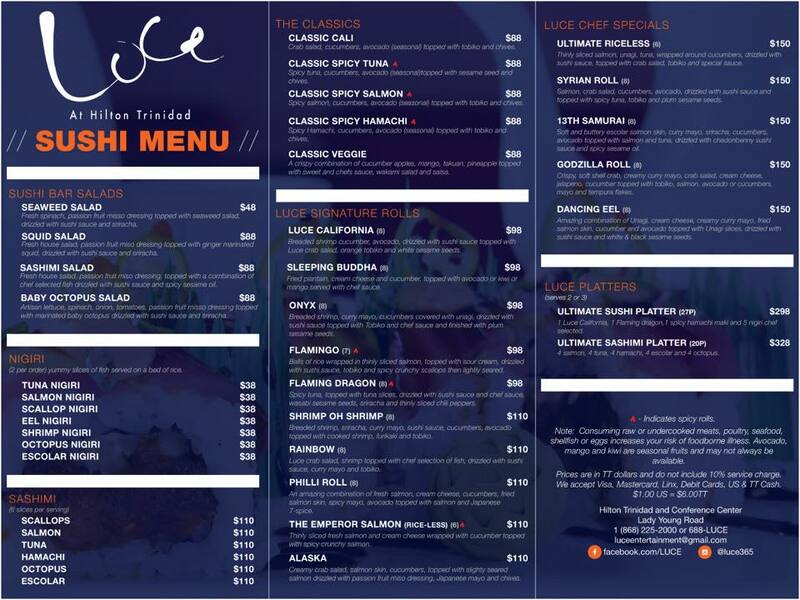 LUCE (Port of Spain) – Located at the Hilton Trinidad with an absolutely fantastic view, LUCE offers up a wide range of rolls including our favorites, the Shrimp-Oh-Shrimp, Ultimate Riceless Roll, Flamingo Roll, Alaskan Roll and the Dragon Roll. (Hours are Tuesday to Sunday, 5pm-11pm.) Link to LUCE menu. (868) 225-2000. 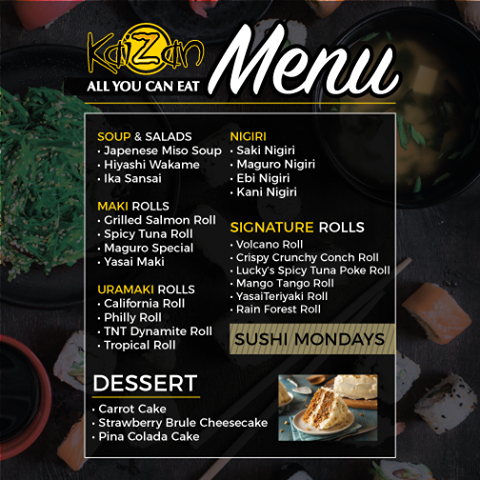 KAIZAN SUSHI (MovieTowne, Port of Spain) – Grab your sushi before or after a movie and check Kaizan’s ode to Trinidad, the Sushi Carnival Roll. Kaizan also has lunch specials. (Hours are 11am – 10:30pm, Monday – Sunday.) Delivery menu and Monday buffet menu, (868) 235-3283. 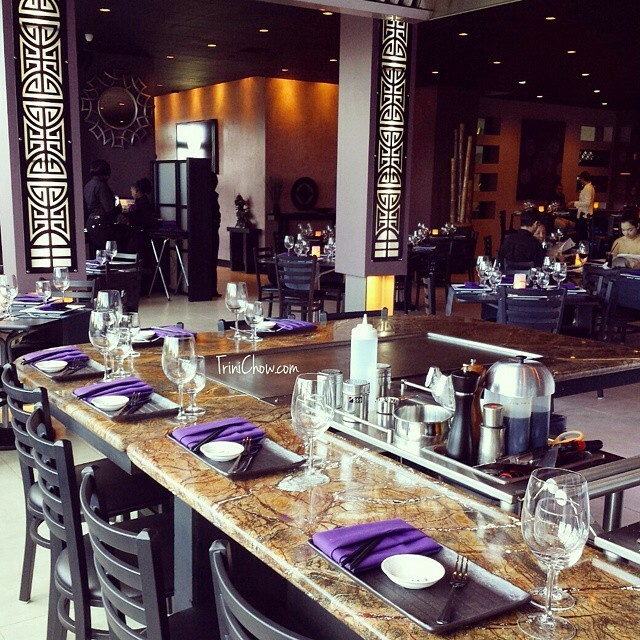 SUSHI BAR – Hyatt Regency Trinidad (Port of Spain) – Take a seat at the bar for sushi, sake and one of the best sushi bar view’s in Trinidad. Sake cocktails and Sapporo beer are also available. (Sushi Bar hours are 5pm-10pm, Monday-Thursday and Saturday; 1pm-10pm Fridays.) (868) 623-2222. 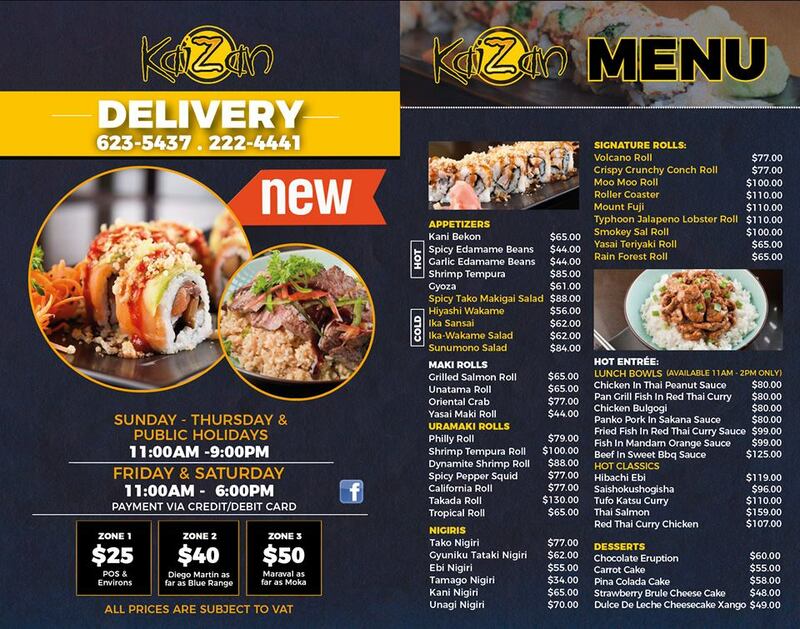 KAIZAN SUSHI (Price Plaza, Chaguanas) – Grab your sushi before or after a movie and check Kaizan’s ode to Trinidad, the Sushi Carnival Roll. Kaizan also has lunch specials. (Hours are 11am – 10:30pm, Monday – Sunday.) Delivery menu and Monday buffet menu. (868) 623-5437. STARLITE PHARMACY (Maraval AND Diego Martin) – Pre-packaged sushi; Roll options include Crab Maki ($40); Plantain Roll ($40); California Roll ($50); and Carnival Roll ($50). SAKURA ARTS (Port of Spain-Cocorite, Westmoorings and Maraval) – Pre-packaged sushi at Superpharm (Gulf View, Trincity, West Moorings, Diego Martin, Maraval, Marabella, Valsayn and Chaguanas; Peake’s One Stop in Cocorite; Roll options ($65) include California Roll; Smoky Salmon; Veggie Roll and more. SUMO SUSHI (Trinidad) – Started by More Vino/More Sushi, SUMO SUSHI offers pre-packaged sushi ($55 to $65) and seaweed salad ($40) at select Massy Stores, Movietowne POS, Cafe le Bistro in Grand Bazaar Food Court, and the SUMO retail location at the UWI campus. Sushi options include Sumo Combo; Dojo California Roll; Kinboshi Spicy Salmon Roll; Mawashi Cream Tuna Roll; Ozeki Shrimp Tempura Roll; and Yokozuna Vegetarian Roll. LINDA’S BAKERY (Trinidad) – Rolls include a Tempura Roll; Spicy Tuna Roll. Sushi is available at select locations. 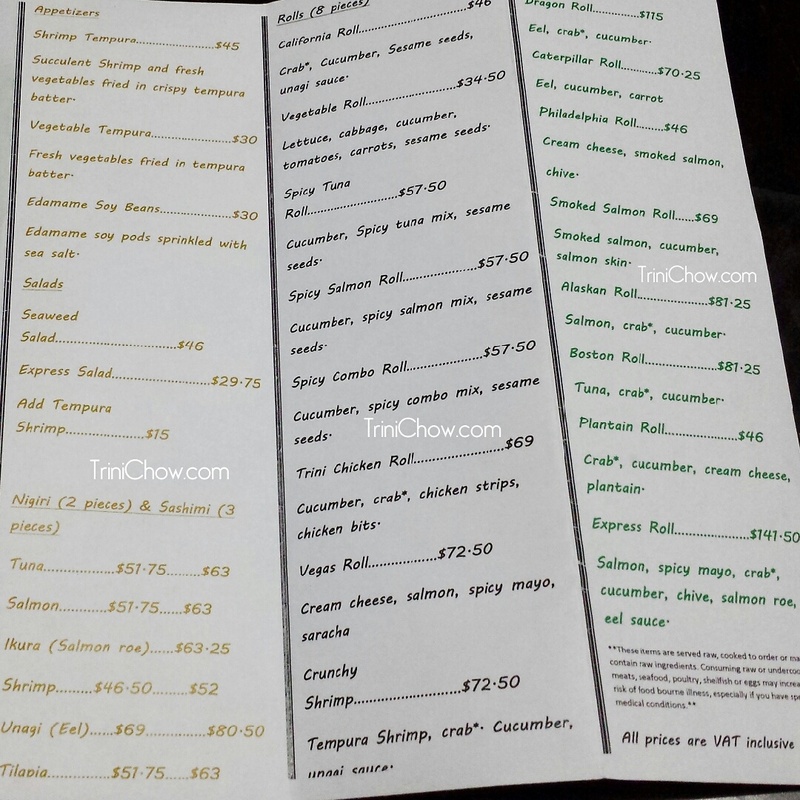 SUSHI SHOP TOBAGO – Offers fresh sushi pick-up orders. 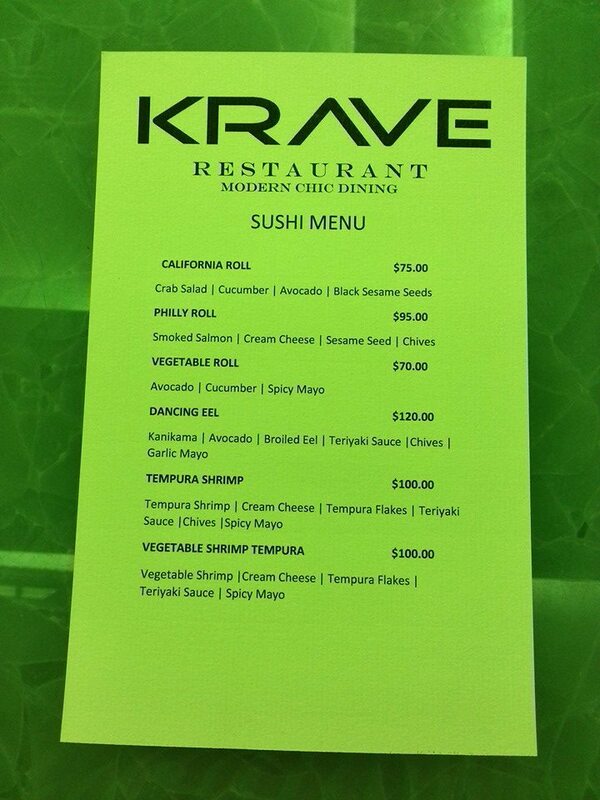 Menu features a California Roll; Salmon Roll; and Tuna Roll, and Wakame Salad and Ceviche. 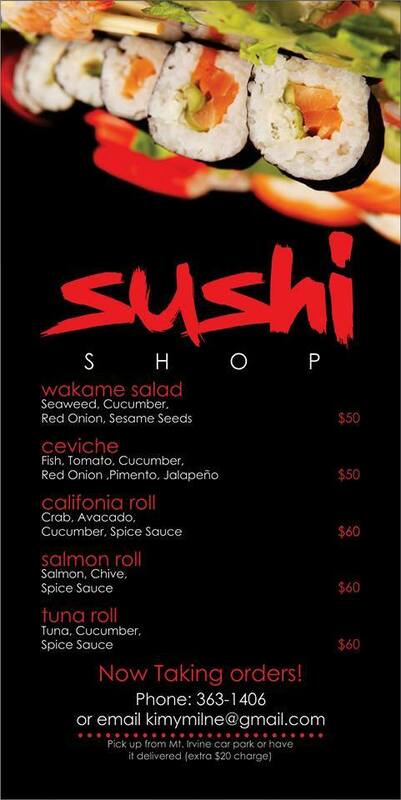 Link to Sushi Shop Tobago Menu. (868) 363-1406 or kimymilne@gmail.com to order. Pick up from The Shade in Bon Accord. FYI: If you want to make your own sushi, HAPPY GOURMET, SEAFOOD ENTERPRISES, THE GOURMET GENIE, MALABAR FARMS and other gourmet grocery stores sell sushi kits and ingredients, and Premium Seafood located at the National Fisheries compound in Port of Spain sells sushi-grade tuna. NOTE: Every effort is made to keep this list updated, but please call to confirm hours as restaurants do change their menus and hours of operation. Follow TriniChow on Facebook to keep up with any new sushi spots and other restaurant news in Trinidad & Tobago. Toppers doesn’t do sushi anymore. tried last week. Thank you, we have updated the listing. Hi, do you know which of these have sushi buffets and what days/times? Sushi Express is no longer operating out of their Curepe branch. Only the one at Piarco Plaza now. Thank you, we’ll update the post accordingly. Which of these has the best ambiance for a birthday dinner? LUCE has a great ambiance (fantastic sunset view). Keep in mind that it’s more lounge than traditional restaurant, but the view, decor and ambiance is top notch. We also like dining outside at More Vino/More Sushi (Woodbrook location) for dinner. The sushi at The Port is awesome! Great service too. where can I buy sakin in T&T? Bottlestop in Maraval carries Moonstone Sake; AMCO’s World of Wines & Spirits in Chaguanas also carries sake; HiLo and Tru Valu also sell it in their alcohol section. Any reviews on Touch n Taste? Hi Candice, sorry we haven’t dined at Touch n Taste yet. I was made aware of a new sushi place opened at Trincity Mall, located opposite Pennywise. Can you confirm and provide restaurant details? Thanks, Jeanine. We’ll update the list. Thank you Kern, we’ll check into Southern Elegance for more information on their sushi service. Hi… Called Olive Tree the other day. They don’t do sushi anymore. So you probably should update. But there is a new place called Sakura sushi. It’s on the same compound as ‘Dim Sum King’ in south. Thanks so much Chantal, we’ll remove Olive Tree from the list and check into Sakura Sushi.